I don't know about you, but we are gearing up for more snow here in Michigan. It would be a perfect time to snuggle up and read a new, good book. 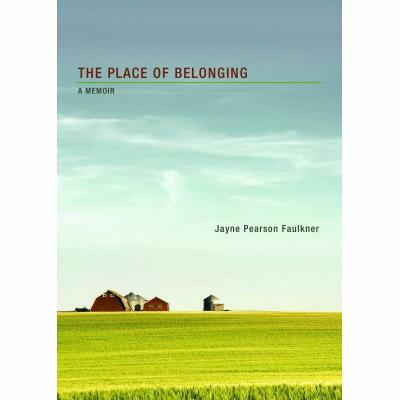 I have a good one to share with you today - The Place of Belonging. This book is written by Jayne Pearson Faulkner, and I think she did a wonderful job. A warm and endearing, yet heart-wrenching memoir, The Place of Belonging, is about a child of a single mother in Big Sky Montana that is beautifully and simply told. It is an unforgettable step back in time, a fresh understanding of loss and belonging. Reading like prose, this elegantly written and emotionally satisfying story is told from the eyes of a child of the 1940’s. I thought this book was a nice escape back into a time when life was more about the basics - getting food on the dinner table, hard work, and family. Since it is told through the eyes of a young girl, it had some really humorous moments and some enduring moments. When you see the world through a child's eyes, ordinary things you may normally take for granted become really special. The author did a great job of describing things so that you could actually see them happening as you were reading. This book also has a way of inviting you into the characters' lives and story. I found myself hurting when they hurt and rejoicing when they rejoiced. I also appreciated that this book was a shorter read. Sometimes when you get a book that has 479 pages in it, you give up before it is over or even before you start.The Place of Belonging was only 190 pages, and it is small and lightweight, so when I wanted to snuggle in bed with it, I could hold it easily. I know it may sound silly, but I appreciated it. I hope you enjoy this book as I did. You can find it here or on Amazon.com or Barnes and Noble. Thank you to Bring It On! Communications for this book for review. Ken Board has it down pat. He tells many stories in this collection and they all - every one of them - make you feel something. Closer to God? Closer to our fellow man? I'm not sure but the tales are funny, entertaining, sad, simple and whilesome and written for each of us to enjoy and think on. In Amusings, Ken takes life tales and makes them his with a power to entrall us with one page of writing. I plan on passing this book on and I know each person who reads it wil lbe touched like I was by Ken's musings and humor. Another book review for all of you to enjoy! When I saw this book, I couldn't believe the title. 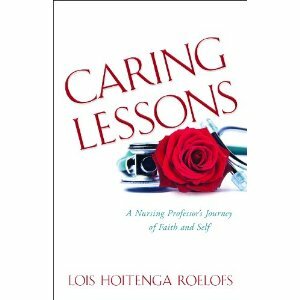 As a Christian nurse who also dabbled as a clinical nursing instructor, this book immediately spoke to me. Reading it only brought back flashbacks of my own clinical experiences. Probably some of the best stories to be heard can be told by nurses. The things we see and people we meet everyday all come with their own stories, often times some of the most miraculous stories you can imagine. I am so glad someone wrote a book to share not only some of those stories, but her own personal story as well. From the very beginning I could connect with Lois. Just a few short months into college I began working as a home health aide. Because I'd expressed an interest in working in pediatrics, my very first assignment was to 2 boys 1 of which was a paraplegic. Since it was my first time there, the mother of the boys walked me through some of the tasks I would need to be doing. Feeding tubes, baths, diaper changes, it was all a huge shock to my young 19 yr old self, especially with these 2 young boys. It was then that I knew pediatrics would not be for me, I was worried, but I found my niche not long after that. Lois brought this memory back to me as she struggled though one of her first rotations and begged her parents to let her quit. Even better when she was asked to be a clinical instructor just fresh out of nursing school, it was almost like we were one in the same! I'd always wanted to be a clinical instructor and it wasn't until we moved, I was pregnant, and no hospital would hire me, that I was given the opportunity to do what I'd always wanted. This concept is a theme throughout this book. Lois guides us through her struggles as a working mother, caring nurse, and student, showing us along the way just how faith and dedication can take you places you never thought you'd be. Her passion and strength through her journey from a student nurse to nursing professor and assistant dean is nothing less than inspiring. I love that Lois highlights the choices women are given in the healthcare field today. That no longer are nurses expected to wait hand and foot on doctors. Probably one of my favorite stories Lois told was when she tried to hide from an angry Dr. who'd come in just to yell at her for questioning him. Any nurse can share a story like this at one point or another. I am so thankful to have entered the nursing field in a generation where this is no longer tolerated (though it does still happen to some extent). I absolutely loved this book and will be sharing it with all my fellow nurses. I definitely recommend this book for anyone thinking about entering the healthcare field, or those already working in healthcare. I guarantee you will find yourself laughing at some parts, crying at others, and completely relatable to Lois. If you want to be motivated and inspired, get your reading on! That is the title of one of the books I was recently sent to review. It is simple, full of deep daily study and a great reading plan. I love the title. God's Word should be our morning manna. It is spirit food for our day﻿ that only God can provide. Oh, we can try to fill that spiritual longing with other things but only God's Word will truly feed us and make us healthy in Him. I was so excited to start this devotional/Bible study because I just recieved an Archeological Bible for a present and these two books go hand in hand. I have really enjoyed digging into my daily devotions each day! 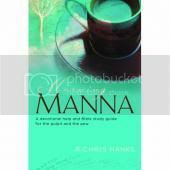 You could use Morning Manna for your personal study or a Bible study or Sunday School class. Each day's lesson is full of scripture and wonderful truths about the daily reading. I look forward to using this book often! 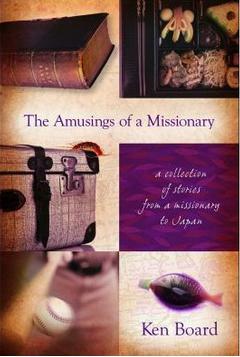 I was also sent The Missionary to review. I have to admit that I chose this book with my husband in mind. Anything that says, "unimaginable nightmare of espionage ending in a desperate, life-or-death gamble to flee the country" screams a book my husband would love. He hasn't read it yet, but I know he will. I saw him eyeing it while I was reading. Well, I kind of taunted him and said something like, "You are going to love this book." I, on the other hand, usually enjoy more of a heart-warming and inspiring story. Something with a little romance mixed in. This book was more on-the-edge suspense than I'm normally up for but the writing was well done and the characters well developed. It really is a great story and is one that will make you think about what you would do. Truly a "roller-coaster read that will keep your adrenaline rushing!" Yeah... that sounds like my husband, doesn't it? Thanks to Bring It On! Communications for sending me these books to review! Being kind, thoughtful, giving and encouraging comes easy for most Christians. But ask them what area needs the most improvement and they will most likely answer, “I’d like to spend more time in God’s Word and praying.” As the clock ticks, and the years go by, there sits our Bible; used seldom, but thought of often. 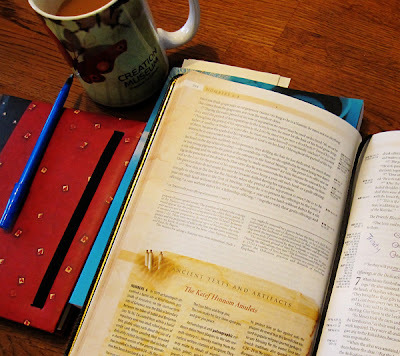 Morning Manna will give your Bible that worn and tattered look you’ve always wanted. One that says, “I’ve been read, and I was good!” Taking you through the Bible in one year and camping on scriptures, (some of which are overlooked), Pastor Chris Hanks brings new devotions to chew on each day from the Word. Morning Manna–it’s food for the soul! No one knows the day or the hour that Jesus will return to earth, but I am always interested in learning what others think about the topic, and how they interpret what will happen. In ‘A Word to the End Time Church ,’ Georgie Newman shares her thoughts after being a Christ follower for over 30 years. Consider this a warning – A Word to the End Time Church – to those yet to establish a relationship with Jesus Christ needing to sincerely consider the claims of the Gospel. It is a warning of false prophets, lukewarm living, depending on an easy-believism gospel and relinquishing our responsibility by following a particular teaching. Consider this a challenge – to Christians everywhere to check where they stand before the Lord and what they need to do for themselves and other so they do not miss out on the first resurrection. Consider this a sounding alarm – that we need to prepare for our future based on correctly dividing the Word of God for ourselves, not depending on others interpretation – and an opportunity to prepare for the end to come, no matter what the timing is. Consider the cost – Our future will be determined by our decisions on this earth, so we need to wake up, take responsibility for what we believe and prepare to endure no matter the cost. As a collective the human race is rushing towards a culmination of a time that will seal their futures – forever. 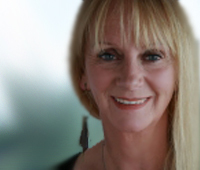 Georgie Newman lives in Australia and is a mother of three. She has been a part of her church using her unique teaching gifts in youth groups and ladies ministries as well as varying age small groups. As a prayer warrior, she has regularly brought prophetic words to her church and feels God called her in 1990 to “Prepare the Bride” for His return. Georgie became a Christian over 30 years ago after a supernatural encounter with the Lord and since then her walk has been full of amazing experiences. She has been called to be a mouthpiece and is an integral part of the church. She has often laughed and wondered if her intensive training over the years is just to sound the triangle at the end of the symphony! If so, take note of what she has written. My prayer for you as you embark on reading this book is that your heart will be quickened by what you read, that your soul will be inspired to equip yourself and others, and that the result will be the total immersion of your spirit in Jesus’ presence and the living Word. Only then will you be nourished to the point of saturation and be able to endure the times ahead. If you wish to run through fire unscathed, you need to saturate yourself in water so there is not one combustible strand the fire can utilize. So too in our lives. When hard times come, especially in the end times, we need to saturate ourselves with the Word and the Spirit so there is not one strand of weakness the enemy can use to bring us down. My prayer is that you will recognize the urgency of equipping yourself by studying the Word, living victoriously, and steadfastly enduring, no matter how the future plays out. The only way to succeed in this kingdom is by humbly walking in the narrow way, which is only possible by grace. Otherwise, after entering the kingdom, we will not endure or be able to live victoriously. The Lord communicates with us in myriad ways. He does not always a write a spectacular message as he did on the wall during Belshazzar’s feast in Daniel 5:1-31. There are far more common ways we can expect to hear from Him. The Bible reveals the nature of God and explains how He wants to relate to humankind. It provides wisdom for us to know how to communicate with the Creator of the universe and provides a blueprint for how we can live a victorious life. It supplies us with the foundation of truth and a yardstick to gauge whether we are hearing correctly. The Bible is God’s unfailing Word to us. If you believe the Lord is telling you something that goes against what the Bible teaches, don’t act on it. This section will help you assess whether you are prepared for one of the greatest events ever to take place in the history of the world. Building in earthquake areas are constructed with stability in mind. So too in our lives, it is wise to ensure that we are building on solid ground, with materials that are structurally sound. We can check our foundation by questioning what beliefs we hold, and why. Personally studying the Bible’s teachings can be likened to using material that has proven to stand the test of time. Taking someone else’s word that an interpretation is correct, without personally checking its validity, is like using nonstructural timber in the framework of a building. As a spectator we may admire a marathon runner and aspire to be like him as we see him run in the public arena, receiving the adulation of the crowd. But how often do we consider the supreme sacrifice these runners pay to attain the status that qualifies them to run in these elite races, winning worldwide recognition and attaining coveted trophies? We know there is a pain barrier that marathon runners need to run through to finish a race. But do we really think about how bad that would be? Do you realize that many athletes train to the point of vomiting? Running well the Christian race will win us a prize worth far more than any earthly reward. Yet as soon as we experience the first twinge of pain, many of us draw back. Marathon runners shun pain and distractions, because the most important things to them is to win. I found this book to be informative to the new believer and a strong reminder for the long-time Christ follower. I thank Georgie for sharing her wisdom with the readers of this book. This book was published by VMI Publishers, and provided by Bring It On! Communications for review and giveaway purposes. You can order this book here . 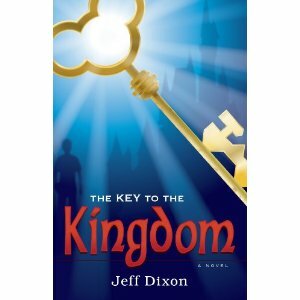 I was definitely intrigued when I received the chance to readThe Key To The Kingdom by Jeff Dixon. Since I had been to Disney recently, I was interested in just what this book was going to entail. This is a fiction novel based on some facts. How many? Well, that is for you to decide. 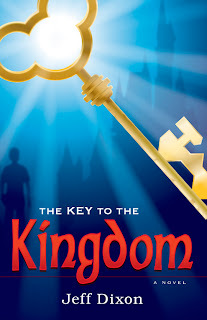 Once I started reading The Key To The Kingdom I really did not want to put it down. It really kept my attention and I wanted to see what happened next. I would definitely recommend this book to anyone who likes a story with a little mystery and suspense. To learn more about this book click herehttp://www.deepriverbooks.com/deepriver-bookstore/new-releases/key-to-the-kingdom.html . *This is my honest opinion. I received the product above thanks to Bring it On Communications and Jeff Dixon. The book was given to me in exchange for review. To view my full disclosure, click on the link at the top of this page. Pookster and Bubs are brother and sister on some silly everyday adventures that turn into lessons well learned. 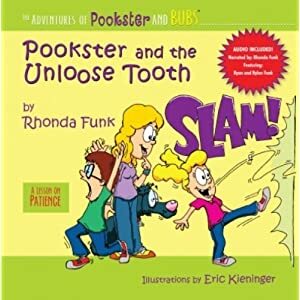 In Pookster and the Unloose tooth, Pookster is impatient to loose her tooth and finds a way to get it out before it’s really time. In the end she finds out that things happen when they should and patience although hard, is something she must learn. After all the hard work to loose her tooth, she’s left with an even longer wait till her next teeth come in. 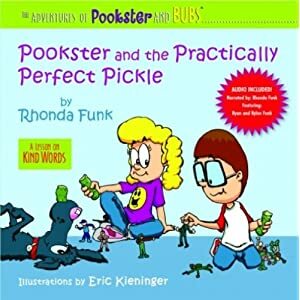 Pookster and the Practically Perfect Pickle is too funny to get through and not laugh about a battle between a green sweet and sour dill pickle and the thought of Bubs stealing away her practically perfect pickle. Choosing sour words and assuming the very worst, Pookster ends up loosing the green treat when she over reacts. Left with no pickle at all she’s realizes that she over reacted when her brother wasn't even after the pickle but just trying to play. In the end Pookster learns that using her sour words instead of sweet ones can hurt someones feelings, and lose something she loves. Apologizes for over reacting to her brother Pookster gets her pickle back and learns a valuable lesson on how to treat others. These two books were too cute!They each come with a CD so the kids can listen to the story while looking at the cute colorful illustrations. My kids love these books, a funny adorable story yet powerful lesson for the kids to learn. I’d recommend any young children to have these around and enjoy. I know I got a kick out of them, so parents would enjoy reading them right along with the kids. 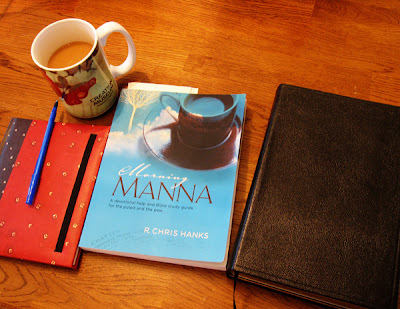 What a wonderful devotional Morning Manna by R. Chris Hanks truly is! This book is written in a simple easy to understand format using the New King James Bible as reference to the scriptures to help it’s reader dig deeper through the Word of God. I’m amazed with how easy it is to read this book. It takes you through the entire Bible from Genesis to Revelation without skipping around in a years time! Note that I can’t say that about a lot of other devotional books. Each day you’ll sit down and read the required Bible Reading, the focused on verse found in the reading, and then the authors thoughts on the daily reading. At the end of each devotion, it list the topics previously discussed in which can be cross referenced in the back of the book. Having the topics there makes it easy for the reader to look up other devotions based on a certain theme. I am getting a lot out of this devotional and would recommend it to those yearning to understand the truths and promises of God. This book I guarantee will encourage, inspire, and leave you hungry for more! Morning Manna: A devotional help and Bible study guide for the pulpit and the pew can be purchased for as little as $11.51 on Amazon. Ahhh, how nice it's been to get back to reading! I was so excited to receive this book for review and share it with all of you! It's been a somewhat stressful and hectic start to the new year for us here with the hubby gone on Military Duty this past month (and for those of you with deployed husbands, I'm not complaining at all, I've been there, this was nothing lol!). All is finally getting back to normal here in this half military household and I've finally had some time to sit down and enjoy myself with this awesome book! The book starts by throwing you right in to the middle of the mystery. In a mysterious meeting with his long time friend Hawk, a florida preacher, is given a key and a few clues that lead him into a week long adventure through Walt Disney World. During his journey the preacher uncovers and shares little known Disney trivia and secrets that will keep any disney fan yearning for more (I myself am now planning my next trip!). Along with some trusted friends, a few enemies along the way, and Mickey Mouse, Hawk travels through the parks focusing on details and searching for answers. The author of this book compares it to the Davinci Code and I would say that is a pretty accurate portrayal with all the clues and enemies he encounters. I am a huge Disney fan, and have been to both Disneyland and Disney World many times. I found myself right back in the park along with Hawk as he searched for clues. I was intrigued by all of the well researched trivia in the book. I have been on the backlot tour in Disney a few times and have learned a ton more from reading this book. I have to say that at first, I wasn't sure I would like this and thought maybe I would be disappointed. But once I got a few chapters in, I was hooked! I'm sure it was not the intention of the author for this to be scary, but there were some parts of this book that kept me leaving the light on at night while my husband was gone. It was a good ending, although I had hoped for a certain character to re-appear in some twist. I'll leave the character's name out as to not spoil your reading. I would definitely recommend this to anyone who is a big Disney fan. If I'd seen this in a store, I know I would have snagged this right up off the shelves. I am one of those who do in a way judge a book by it's cover (of course I always read the back first and then decide) and this cover pretty much had me sold right from the start. Consider this a warning - A Word to the End Time Church - to those yet to establish a relationship with Jesus Christ needing to sincerely consider the claims of the Gospel. It is warning of false prophets, lukewarm living, depending on an easy-believism gospel and relinquishing our responsibility by following a particular teaching. Consider this a challenge - to Christians everywhere to check where they stand before the Lord and what they need to do for themselves and others so they do not miss out on the first resurrection. Consider this a sounding alarm - that we need to prepare for our future based on correctly dividing the Word of God for ourselves, not depending on others interpretation - and an opportunity to prepare for the end to come, no matter what the timing is. Consider the cost - Our future will be determined by our decisions on this earth, so we need to wake up, take responsibility for what we believe and prepare to endure no matter the cost. I had a hard time with this portion of the book. I felt that the author's tone sounded very overly-spiritual. She uses A LOT of language that I think only those who have been Christians for some time would understand - that churchy kind of language that is learned the longer you attend church. I think that she had a lot of good things to say - and that her heart is in the right place, but I just had a hard time with her delivery. I felt this portion of the book was a little hard to relate too. I enjoyed this portion of the book much more - and felt that it really was the Word to the End Time Church as the title claims. This section was very good. The chapters dealing with Biblical end-time prophecy was enlightening, intriguing and a little scary. The author really drives home the importance of living our lives according to Biblical principles and aligning ourselves with Christ NOW and becoming mature Christians NOW so that we can survive the hard times that are swiftly approaching. Disclaimer: I was provided a copy of A Word to the End Time Church from Bring It On Publications in exchange for my honest review. All opinions in this post and on this blog are my own.